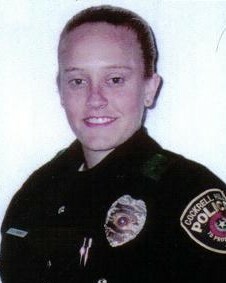 Police Officer Tiffany Catherine Hickey has passed on, seven years ago, "In the Line of Duty," and in giving her LAST FULL MEASURE, has left a "Light of Love & Service"
that only grows brighter, day by day, for her family, peers, friends & especially for all young men & women who aspire to follow her lead into a law enforcement career. Well done Officer Hickey! Your Light Shines brightly, even to Los Angeles, where I only know of you & your ultimate sacrifice by way of an email friend in Cockrell Hill, who knew you and misses you still. And now Tiff, please beam down an extra bright smile on your loving Mom Cathy, Dad Lee & Brother Chad, to let them know that many more people still, will learn of your Love & Service to Cockrell Hill, Texas & your ultimate sacrifice! Officer Hickey you are a hero. It has been seven years since the end of your watch and you are still remembered, you will never be forgotten. Rest in peace my sister. May God bless your loved ones. A person remembered with so much love and respect never dies but continues to live on in the hearts and minds of others.G-d's Will hath no Why but one day all will be made clear to us.Until then Rest in Peace and may Our Lord Comfort and Strengthen your family and friends. Tiffany, tomorrow marks the day that seven years ago your tragic accident happened. Cannot tell you enough how much and how often you are thought of. Just wanted to let you and your family know that you are thought of and missed. Keep being that angel in the sky that watches over me at work. I never met you but I met some friends of yours tonight at a resturant in a small town in Louisiana your mom and dad were there but I did not get the chance to meet them. I looked up your picture to see the wonderful young woman that so many people loved and adored. What a beautiful young woman. I was at the resturant tonight celebrating my oldest daughters high school graduation. I thought your friends were great and I loved the t-shirts they had on in memory of you. Im happy I was able to find page. I was thinking today about things that happened so long ago and your name came into my head. It's hard to believe that time has passed so quickly since you left. And, although I did not know you well, the moments I had with you have stuck with me forever. I look up to you for all your accomplishments and hard work and I hope that your family is doing well. All officers in bureaus now have to ride a week in patrol every six months. I completed by week yesterday. I worked at the SW Division. On the way to the station I always drove past your picture at Illinois and Cockrell Hill. Every day I asked that you watch after me and all the others. You did, thank you guardian angel. I need only to look inside. Rest easy, Sister. Your watch is now ours. I come to the page, I read the reflections (from the first to the last), I cry ( I do that a lot) then I leave. No one knows how much I miss you and love you. I hope that your friends and families' pain has eased with time, Thank you for your service, A hero never dies, Rest in peace. I did not know Tiffany but I know she must have been a very loving person. I've seen her beautiful grave marker and numerous stuffed animals and other offerings left at her resting place. It is not far from the grave of Dimebag Darrell Abbot, who now may be the most famous residents of the cemetery although all are equal in the eyes of God. Tiffany is resting with the angels, and that should be comforting to those who grieve. Tiffany... I never had the pleasure of meeting you but by the reflections on on your memorial page I can see you were very much loved and respected. We have lost 2 officers in the Fort Worth/Dallas area lately and it has been a very trying month here. With the lose of those officers I find myself looking at the ODMP everyday hoping and praying another name is not added. I found your page and it jarred my memory of that awful time when you were taken from your family and loved ones. God Bless you for your determination in realizing your dream. We hear so many bad things about police in the papers I come here to read and remember we are loved and what we go out and do everyday is not in vain. And as you know being a female police officer takes just a little bit more special person and your were that person. Rest in Peace Tiffany, you will always be in my thoughts as I go out there and do the best job I can. Wanted to let your family know I am thinking of them. (I know that you already know I think of you every single day). You were an angel on earth and I miss you. I know you are welcoming our most recent Angel Officers Jackson and Nava. Thank you for continuing to look after us. Yesterday, December 1, 2005, Officer Henry "Hank" Nava, Jr. passed away at the age of 39. I never met him just like I never had the opportunity or privilage to meet you, but I find myself thinking of you both and praying for you and your families. Please let Officer Nava know that we miss him as we miss you and that like you he left this world far to early. You touched so many lives in your short time on this Earth and I know that you are watching us from Heaven. A brother officer passed away today as a result of a shooting. H.H (Hank) Nava was an outstanding officer and a good friend. Please Give him a GRAND WELCOME and let him know that We are praying for his family. Keep watch over the rest of us as always!! Thanks for being my Guardian Angel! I met you many years ago when you were a Police Explorer in Arlington. I was Proud to see you excel with you dream, yet sad to learn of your accomplishment through your tragedy. Sorry I have taken so long to leave a reflection but I have had your Obituary on my wall since it was printed. I have been asked many times who you are and I reply that you are my "Guardian Angel". God bless you ,your Family and Departmment. Your desire to serve and make a difference will not be forgotten. Just thought I would leave you a note to let you know that you are so very dearly missed. I find it so very hard not to see you out on the lawn now that we have moved back to Arlington...but I know that you are watching over all of us and that is a comfort.